The Castalian Springs, TN area has had 4 reports of on-the-ground hail by trained spotters, and has been under severe weather warnings 19 times during the past 12 months. Doppler radar has detected hail at or near Castalian Springs, TN on 51 occasions, including 7 occasions during the past year. 3/30/2019 7:12 PM CDT At 711 pm cdt, severe thunderstorms were located along a line extending from 11 miles southeast of scottsville to near hartsville, moving east at 65 mph (radar indicated). Hazards include 60 mph wind gusts. Expect damage to roofs, siding, and trees. locations impacted include, lebanon, lafayette, hartsville, westmoreland and dickerson chapel recreation area. this includes the following highways, interstate 40 between mile markers 232 and 242. Interstate 840 between mile markers 75 and 76. 12/31/2018 2:51 PM CST At 250 pm cst, severe thunderstorms were located along a line extending from 9 miles northeast of scottsville to near mount juliet, moving northeast at 70 mph (radar indicated). Hazards include 60 mph wind gusts. Expect damage to roofs, siding, and trees. Locations impacted include, murfreesboro, franklin, gallatin, lebanon, lafayette, hartsville, hendersonville, smyrna, brentwood, la vergne, mount juliet, nolensville, westmoreland, hermitage, walterhill, rural hill, antioch, belinda city, bethpage and oak grove. 11/5/2018 10:33 PM CST At 1032 pm cst, a severe thunderstorm capable of producing a tornado was located over gallatin, moving east at 35 mph (radar indicated rotation). Hazards include tornado. Flying debris will be dangerous to those caught without shelter. mobile homes will be damaged or destroyed. damage to roofs, windows, and vehicles will occur. tree damage is likely. Locations impacted include, gallatin, hendersonville, bledsoe creek state park, cottontown, dickerson chapel recreation area and bethpage. 11/5/2018 10:20 PM CST At 1020 pm cst, a severe thunderstorm capable of producing a tornado was located near millersville, or 8 miles west of gallatin, moving east at 40 mph (radar indicated rotation). Hazards include tornado. Flying debris will be dangerous to those caught without shelter. mobile homes will be damaged or destroyed. damage to roofs, windows, and vehicles will occur. Tree damage is likely. 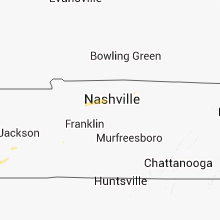 8/21/2018 12:08 AM CDT The national weather service in nashville has issued a * severe thunderstorm warning for. eastern sumner county in middle tennessee. northwestern macon county in middle tennessee. northwestern trousdale county in middle tennessee. Until 1245 am cdt. 7/21/2018 1:21 AM CDT At 120 am cdt, a severe thunderstorm was located near watertown, or 10 miles southwest of carthage, moving east at 20 mph (radar indicated). Hazards include 60 mph wind gusts and quarter size hail. Hail damage to vehicles is expected. Expect wind damage to roofs, siding, and trees. 6/27/2018 4:46 PM CDT At 446 pm cdt, a severe thunderstorm was located near castalian springs, moving east at 45 mph (radar indicated). Hazards include 70 mph wind gusts and penny size hail. Expect considerable tree damage. damage is likely to mobile homes, roofs, and outbuildings. Locations impacted include, gallatin, lafayette, hartsville, westmoreland, bethpage, oak grove, bledsoe creek state park and dickerson chapel recreation area. 6/27/2018 4:39 PM CDT At 439 pm cdt, severe thunderstorms were located along a line extending from near westmoreland to near gallatin, moving east at 50 mph (radar indicated). Hazards include 60 mph wind gusts and penny size hail. Expect damage to roofs, siding, and trees. Locations impacted include, gallatin, lafayette, hartsville, hendersonville, goodlettsville, white house, millersville, westmoreland, portland, mitchellville, bethpage, oak grove, bledsoe creek state park, dickerson chapel recreation area and cottontown. 6/24/2018 7:39 PM CDT At 739 pm cdt, a severe thunderstorm was located near hartsville, moving east at 25 mph (radar indicated). Hazards include 60 mph wind gusts and quarter size hail. Hail damage to vehicles is expected. Expect wind damage to roofs, siding, and trees. 6/11/2018 7:39 PM CDT At 724 pm cdt, a severe thunderstorm was located 7 miles east of gallatin, and is nearly stationary (radar indicated). Hazards include 60 mph wind gusts and quarter size hail. Hail damage to vehicles is expected. Expect wind damage to roofs, siding, and trees. 6/11/2018 7:24 PM CDT At 724 pm cdt, a severe thunderstorm was located 7 miles east of gallatin, and is nearly stationary (radar indicated). Hazards include 60 mph wind gusts and quarter size hail. Hail damage to vehicles is expected. Expect wind damage to roofs, siding, and trees. 6/10/2018 3:43 PM CDT At 342 pm cdt, a severe thunderstorm was located near white house, or 7 miles northwest of gallatin, moving south at 20 mph (radar indicated). Hazards include 60 mph wind gusts and penny size hail. Expect damage to roofs, siding, and trees. locations impacted include, gallatin, hendersonville, goodlettsville, white house, millersville, cross plains, portland, orlinda, cottontown and bledsoe creek state park. This includes interstate 65 between mile markers 101 and 102, and between mile markers 105 and 120. 5/20/2018 6:58 PM CDT At 658 pm cdt, a severe thunderstorm was located near westmoreland, or 13 miles northeast of gallatin, moving northeast at 20 mph (radar indicated). Hazards include 60 mph wind gusts and quarter size hail. Hail damage to vehicles is expected. expect wind damage to roofs, siding, and trees. Locations impacted include, gallatin, westmoreland, oak grove and bethpage. 5/20/2018 6:38 PM CDT At 638 pm cdt, a severe thunderstorm was located 8 miles north of gallatin, moving northeast at 20 mph (radar indicated). Hazards include 60 mph wind gusts and quarter size hail. Hail damage to vehicles is expected. Expect wind damage to roofs, siding, and trees. 4/14/2018 8:46 AM CDT At 845 am cdt, a severe thunderstorm was located 7 miles east of white house, or 8 miles northwest of gallatin, moving east at 35 mph (radar indicated). Hazards include 60 mph wind gusts. Expect damage to roofs, siding, and trees. Locations impacted include, gallatin, westmoreland, oak grove, bledsoe creek state park, cottontown and bethpage. 2/24/2018 10:33 PM CST At 1032 pm cst, a severe thunderstorm was located over gallatin, moving east at 55 mph (radar indicated). Hazards include 60 mph wind gusts. Expect damage to roofs, siding, and trees. locations impacted include, gallatin, lebanon, nashville, madison, hendersonville, brentwood, mount juliet, goodlettsville, millersville, forest hills, oak hill, belle meade, lakewood, ridgetop, hermitage, rural hill, bellevue, antioch, belinda city and old hickory. A tornado watch remains in effect until 200 am cst for middle tennessee. 2/24/2018 10:15 PM CST At 1014 pm cst, a severe thunderstorm was located 8 miles southwest of westmoreland, or 9 miles northeast of gallatin, moving east at 35 mph (radar indicated). Hazards include 60 mph wind gusts and penny size hail. Expect damage to roofs, siding, and trees. this severe storm will be near, hartsville and westmoreland around 1030 pm cst. other locations impacted by this severe thunderstorm include oak grove, bledsoe creek state park, cottontown and bethpage. A tornado watch remains in effect until 200 am cst for middle tennessee. 2/24/2018 9:59 PM CST At 958 pm cst, a severe thunderstorm was located near white house, or 10 miles northwest of gallatin, moving east at 35 mph (radar indicated). Hazards include 60 mph wind gusts and penny size hail. Expect damage to roofs, siding, and trees. this severe thunderstorm will be near, gallatin around 1010 pm cst. hartsville and westmoreland around 1030 pm cst. other locations impacted by this severe thunderstorm include oak grove, bledsoe creek state park, cottontown and bethpage. A tornado watch remains in effect until 200 am cst for middle tennessee. 11/18/2017 4:38 PM CST At 438 pm cst, severe thunderstorms were located along a line extending from portland to thompson`s station, moving east at 50 mph (radar indicated). Hazards include 70 mph wind gusts. Expect considerable tree damage. damage is likely to mobile homes, roofs, and outbuildings. 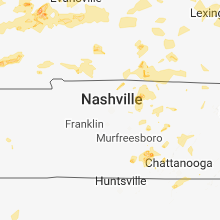 Locations impacted include, murfreesboro, franklin, gallatin, lebanon, springfield, nashville, madison, hendersonville, smyrna, brentwood, la vergne, spring hill, mount juliet, goodlettsville, white house, millersville, greenbrier, nolensville, forest hills and oak hill. 5/27/2017 7:31 PM CDT At 730 pm cdt, a severe thunderstorm was located over hartsville, moving east at 45 mph (radar indicated). Hazards include 70 mph wind gusts and quarter size hail. Hail damage to vehicles is expected. expect considerable tree damage. wind damage is also likely to mobile homes, roofs, and outbuildings. Locations impacted include, gallatin, lafayette, hartsville, hendersonville, westmoreland, cottontown, bethpage, dixon springs, oak grove, bledsoe creek state park and dickerson chapel recreation area. 5/27/2017 7:15 PM CDT At 715 pm cdt, a severe thunderstorm was located over gallatin, moving east at 50 mph (radar indicated). Hazards include 70 mph wind gusts and quarter size hail. Hail damage to vehicles is expected. expect considerable tree damage. Wind damage is also likely to mobile homes, roofs, and outbuildings. 4/30/2017 3:47 PM CDT At 346 pm cdt, severe thunderstorms were located along a line extending from 9 miles southwest of scottsville to near westmoreland, moving northeast at 55 mph (radar indicated). Hazards include 60 mph wind gusts. Expect damage to roofs, siding, and trees. locations impacted include, gallatin, lafayette, hartsville, westmoreland, bethpage, oak grove and bledsoe creek state park. A tornado watch remains in effect until 700 pm cdt for middle tennessee. 3/27/2017 4:39 PM CDT The severe thunderstorm warning for sumner, north central wilson, southwestern macon and northwestern trousdale counties will expire at 445 pm cdt, the storm which prompted the warning has been replaced with a new severe thunderstorm warning. 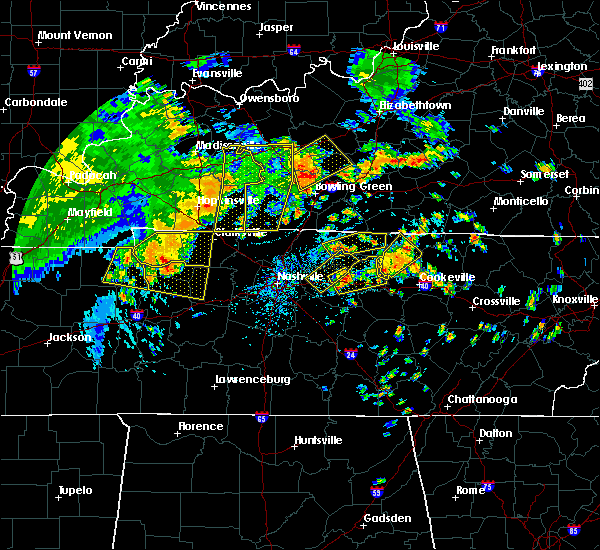 a severe thunderstorm watch remains in effect until 1000 pm cdt for middle tennessee. remember, a severe thunderstorm warning still remains in effect for sumner, trousdale, and macon counties. 3/27/2017 4:28 PM CDT At 427 pm cdt, a severe thunderstorm was located near gallatin, moving northeast at 45 mph (radar indicated). Hazards include 60 mph wind gusts and quarter size hail. Hail damage to vehicles is expected. expect wind damage to roofs, siding, and trees. Locations impacted include, gallatin, lafayette, white house, westmoreland, portland, mitchellville, cottontown, bethpage, oak grove and bledsoe creek state park. 3/27/2017 4:19 PM CDT At 418 pm cdt, a severe thunderstorm was located over gallatin, moving northeast at 50 mph (emergency management. radar indicated). Hazards include 70 mph wind gusts and quarter size hail. Hail damage to vehicles is expected. expect considerable tree damage. wind damage is also likely to mobile homes, roofs, and outbuildings. Locations impacted include, gallatin, lafayette, hendersonville, mount juliet, goodlettsville, white house, millersville, westmoreland, portland, mitchellville, bethpage, oak grove, bledsoe creek state park and cottontown. 3/27/2017 4:14 PM CDT At 413 pm cdt, a severe thunderstorm was located near gallatin, moving northeast at 45 mph (radar indicated). Hazards include 60 mph wind gusts and quarter size hail. Hail damage to vehicles is expected. Expect wind damage to roofs, siding, and trees. 3/27/2017 4:07 PM CDT At 406 pm cdt, a severe thunderstorm was located over hendersonville, or 8 miles west of gallatin, moving northeast at 50 mph (emergency management). Hazards include 60 mph wind gusts and quarter size hail. Hail damage to vehicles is expected. expect wind damage to roofs, siding, and trees. Locations impacted include, gallatin, madison, hendersonville, mount juliet, goodlettsville, white house, millersville, lakewood, cross plains, hermitage, old hickory, orlinda, bledsoe creek state park and cottontown. 3/27/2017 3:52 PM CDT At 352 pm cdt, a severe thunderstorm was located near nashville, moving northeast at 50 mph (radar indicated). Hazards include 70 mph wind gusts and quarter size hail. Hail damage to vehicles is expected. expect considerable tree damage. Wind damage is also likely to mobile homes, roofs, and outbuildings. 3/1/2017 6:55 AM CST At 654 am cst, severe thunderstorms were located along a line extending from near springfield to near oak hill to near thompson`s station, moving east at 65 mph (radar indicated). Hazards include 70 mph wind gusts and nickel size hail. Expect considerable tree damage. Damage is likely to mobile homes, roofs, and outbuildings. 2/7/2017 10:41 AM CST The national weather service in nashville has issued a * severe thunderstorm warning for. western smith county in middle tennessee. rutherford county in middle tennessee. southeastern sumner county in middle tennessee. Wilson county in middle tennessee. 2/7/2017 10:25 AM CST At 1024 am cst, severe thunderstorms were located along a line extending from hendersonville to thompson`s station, moving east at 50 mph (radar indicated). Hazards include 60 mph wind gusts and penny size hail. Expect damage to roofs, siding, and trees. 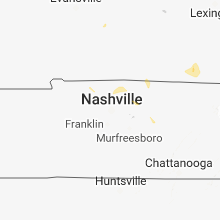 Locations impacted include, murfreesboro, franklin, gallatin, lebanon, nashville, madison, hendersonville, smyrna, brentwood, la vergne, spring hill, mount juliet, goodlettsville, millersville, nolensville, forest hills, oak hill, belle meade, lakewood and thompson`s station. 2/7/2017 10:11 AM CST At 1010 am cst, severe thunderstorms were located along a line extending from near joelton to near franklin, moving east at 50 mph (radar indicated). Hazards include 70 mph wind gusts. Expect considerable tree damage. Damage is likely to mobile homes, roofs, and outbuildings. 12/17/2016 11:41 PM CST The severe thunderstorm warning for west central smith, southeastern sumner, trousdale, northeastern wilson and southwestern macon counties will expire at 1145 pm cst, the storm which prompted the warning has weakened below severe limits, and no longer poses an immediate threat to life or property. therefore the warning will be allowed to expire. 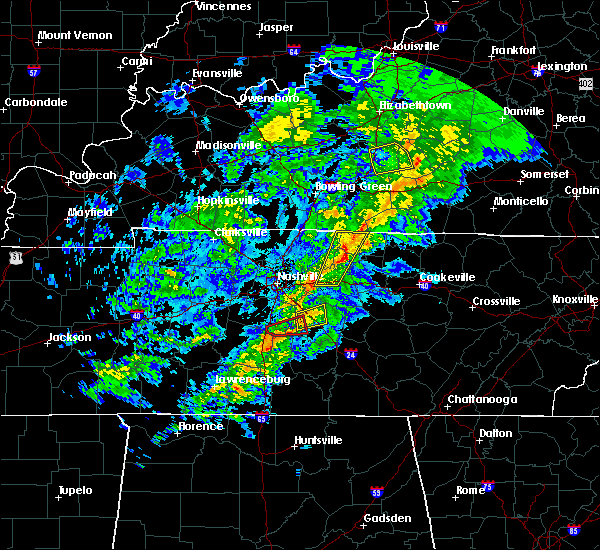 a tornado watch remains in effect until 300 am cst for middle tennessee. 12/17/2016 11:30 PM CST At 1130 pm cst, a severe thunderstorm was located near gallatin, moving northeast at 40 mph (radar indicated). Hazards include 60 mph wind gusts. Expect damage to roofs, siding, and trees. locations impacted include, gallatin, lebanon, hartsville, dickerson chapel recreation area and bledsoe creek state park. A tornado watch remains in effect until 300 am cst for middle tennessee. 11/28/2016 6:49 PM CST At 648 pm cst, severe thunderstorms were located along a line extending from near westmoreland to castalian springs to near la vergne, moving east at 45 mph (radar indicated). Hazards include 60 mph wind gusts. Expect damage to roofs. siding. and trees. Locations impacted include, gallatin, lebanon, lafayette, hartsville, smyrna, la vergne, mount juliet, westmoreland, belinda city, walterhill, dickerson chapel recreation area, bledsoe creek state park, cedars of lebanon state park, tuckers crossroads, gladeville and bethpage. 11/28/2016 6:34 PM CST At 634 pm cst, severe thunderstorms were located along a line extending from portland to near antioch, moving east at 40 mph (radar indicated). Hazards include 60 mph wind gusts. Expect damage to roofs. siding. And trees. 7/8/2016 9:10 PM CDT At 909 pm cdt, severe thunderstorms were located along a line extending from lafayette to thompson`s station, moving east at 60 mph (trained weather spotters. numerous trees and power lines have been blown down with these storms all across the nashville metro area). Hazards include 70 mph wind gusts and quarter size hail. Hail damage to vehicles is expected. expect considerable tree damage. wind damage is also likely to mobile homes, roofs, and outbuildings. Locations impacted include, murfreesboro, franklin, gallatin, lebanon, lafayette, carthage, hartsville, nashville, madison, hendersonville, smyrna, brentwood, la vergne, spring hill, mount juliet, goodlettsville, white house, nolensville, forest hills and oak hill. 7/8/2016 9:06 PM CDT At 905 pm cdt, severe thunderstorms were located along a line extending from westmoreland to near thompson`s station, moving east at 45 mph (trained spotters. at 9 pm cdt...60 mph winds were estimated at the nws nashville office in old hickory. numerous trees and power lines have been blown down with these storms across the nashville metro area). Hazards include 60 mph wind gusts and quarter size hail. Hail damage to vehicles is expected. expect wind damage to roofs, siding, and trees. Locations impacted include, murfreesboro, franklin, gallatin, lebanon, lafayette, carthage, hartsville, nashville, madison, hendersonville, smyrna, brentwood, la vergne, spring hill, mount juliet, goodlettsville, white house, nolensville, forest hills and oak hill. 7/8/2016 8:50 PM CDT At 849 pm cdt, severe thunderstorms were located along a line extending from portland to near thompson`s station, moving east at 55 mph (radar indicated). Hazards include 60 mph wind gusts and quarter size hail. Hail damage to vehicles is expected. Expect wind damage to roofs, siding, and trees. 7/7/2016 3:36 PM CDT At 335 pm cdt, a severe thunderstorm was located near hartsville, moving southeast at 35 mph (radar indicated). Hazards include 60 mph wind gusts. Expect damage to roofs. siding. and trees. Locations impacted include, gallatin, lafayette, hartsville, westmoreland, dickerson chapel recreation area, bledsoe creek state park and bethpage. 7/7/2016 3:09 PM CDT At 308 pm cdt, a severe thunderstorm was located 8 miles west of westmoreland, or 11 miles north of gallatin, moving east at 40 mph (radar indicated). Hazards include 60 mph wind gusts. Expect damage to roofs. siding. And trees. 7/6/2016 4:35 PM CDT At 435 pm cdt, severe thunderstorms were located along a line extending from celina to near rural hill, moving east at 60 mph (radar indicated). Hazards include 60 mph wind gusts and penny size hail. Expect damage to roofs. siding. and trees. Locations impacted include, gallatin, lebanon, lafayette, hartsville, nashville, madison, hendersonville, mount juliet, goodlettsville, forest hills, oak hill, belle meade, lakewood, hermitage, belinda city, bellevue, old hickory, antioch, rural hill and berry hill. 7/6/2016 4:20 PM CDT At 419 pm cdt, severe thunderstorms were located along a line extending from lafayette to oak hill, moving east at 55 mph (radar indicated). Hazards include 60 mph wind gusts and penny size hail. Expect damage to roofs. siding. and trees. Locations impacted include, gallatin, lebanon, lafayette, hartsville, nashville, madison, hendersonville, mount juliet, goodlettsville, white house, millersville, forest hills, oak hill, belle meade, lakewood, westmoreland, hermitage, belinda city, bellevue and old hickory. 7/6/2016 3:49 PM CDT At 349 pm cdt, severe thunderstorms were located along a line extending from three springs to near white house, moving east at 60 mph (radar indicated). Hazards include 60 mph wind gusts and penny size hail. Expect damage to roofs. siding. and trees. Locations impacted include, gallatin, springfield, white house, millersville, greenbrier, westmoreland, ridgetop, cross plains, portland, orlinda, mitchellville, bledsoe creek state park, cottontown, bethpage, oak grove and black jack. 7/6/2016 3:34 PM CDT At 333 pm cdt, severe thunderstorms were located along a line extending from russellville to near greenbrier, moving east at 60 mph (radar indicated). Hazards include 60 mph wind gusts and penny size hail. Expect damage to roofs. siding. And trees. 7/6/2016 3:08 PM CDT The severe thunderstorm warning for southeastern sumner, trousdale and northern wilson counties will expire at 315 pm cdt, the storm which prompted the warning has moved out of the area. therefore the warning will be allowed to expire. 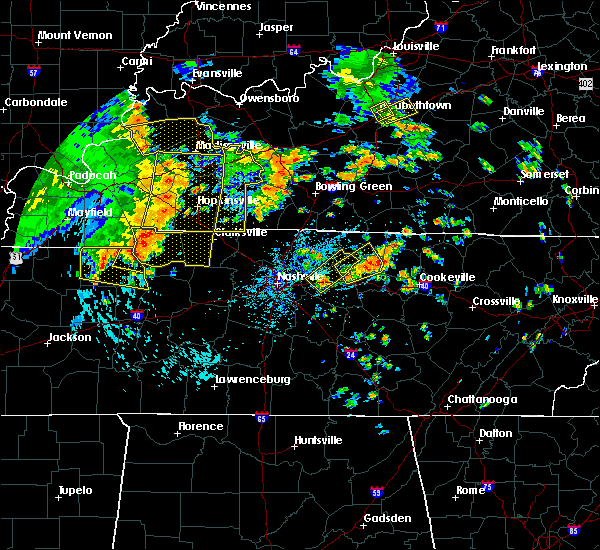 a severe thunderstorm watch remains in effect until 900 pm cdt for middle tennessee. 7/6/2016 2:44 PM CDT At 243 pm cdt, a severe thunderstorm was located over lebanon, moving northeast at 40 mph (radar indicated). Hazards include 60 mph wind gusts and nickel size hail. Expect damage to roofs. siding. And trees. 7/4/2016 2:55 PM CDT At 255 pm cdt, a severe thunderstorm was located 7 miles west of hartsville, moving northeast at 45 mph (radar indicated). Hazards include 60 mph wind gusts. Expect damage to roofs. siding. and trees. Locations impacted include, gallatin, lebanon, lafayette, hartsville, westmoreland, dickerson chapel recreation area, bledsoe creek state park, dixon springs, pleasant shade and bethpage. 7/4/2016 2:42 PM CDT At 242 pm cdt, a severe thunderstorm was located near mount juliet, or 7 miles south of gallatin, moving northeast at 45 mph (radar indicated). Hazards include 60 mph wind gusts. Expect damage to roofs. siding. And trees. 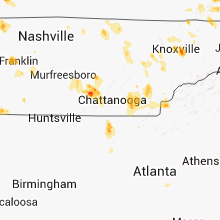 6/15/2016 4:07 PM CDT At 405 pm cdt, severe thunderstorms were located along a line extending from portland to goodlettsville to 6 miles northwest of belle meade, moving southeast at 35 mph (radar indicated). Hazards include 60 mph wind gusts. Expect damage to roofs. siding. and trees. Locations impacted include, gallatin, lebanon, springfield, nashville, madison, hendersonville, mount juliet, goodlettsville, white house, millersville, greenbrier, forest hills, oak hill, coopertown, belle meade, lakewood, westmoreland, ridgetop, cross plains and portland. 6/15/2016 3:52 PM CDT At 351 pm cdt, severe thunderstorms were located along a line extending from 6 miles west of cross plains to near joelton, moving east at 40 mph (radar indicated). Hazards include 60 mph wind gusts. Expect damage to roofs. siding. And trees. 5/12/2016 2:29 PM CDT At 229 pm cdt, a severe thunderstorm was located near hartsville, moving northeast at 35 mph (radar indicated). Hazards include 60 mph wind gusts. Expect damage to roofs. siding. And trees. 5/10/2016 11:38 PM CDT At 1137 pm cdt, severe thunderstorms were located along a line extending from 6 miles southeast of gallatin to mount juliet to near hermitage, moving southeast at 20 mph (radar indicated). Hazards include golf ball size hail and 60 mph wind gusts. People and animals outdoors will be injured. expect hail damage to roofs, siding, windows, and vehicles. expect wind damage to roofs, siding, and trees. Locations impacted include, gallatin, lebanon, nashville, madison, hendersonville, mount juliet, goodlettsville, millersville, lakewood, hermitage, belinda city, old hickory, rural hill, bledsoe creek state park, whites creek, percy priest lake and gladeville. 5/10/2016 11:11 PM CDT At 1110 pm cdt, severe thunderstorms were located along a line extending from near gallatin to near old hickory to near joelton, moving east at 30 mph (radar indicated). Hazards include golf ball size hail and 60 mph wind gusts. People and animals outdoors will be injured. expect hail damage to roofs, siding, windows, and vehicles. Expect wind damage to roofs, siding, and trees. 5/10/2016 10:40 PM CDT At 1040 pm cdt, a severe thunderstorm was located 7 miles northeast of gallatin, moving east at 20 mph. this is a very dangerous storm (radar indicated). Hazards include softball size hail. People and animals outdoors will be severely injured. Expect shattered windows, extensive damage to roofs, siding, and vehicles. 5/10/2016 10:34 PM CDT At 1034 pm cdt, a severe thunderstorm was located 7 miles southwest of westmoreland, or 9 miles northeast of gallatin, moving east at 30 mph (radar indicated). Hazards include golf ball size hail. People and animals outdoors will be injured. expect damage to roofs, siding, windows, and vehicles. locations impacted include, gallatin, westmoreland, bethpage and bledsoe creek state park. 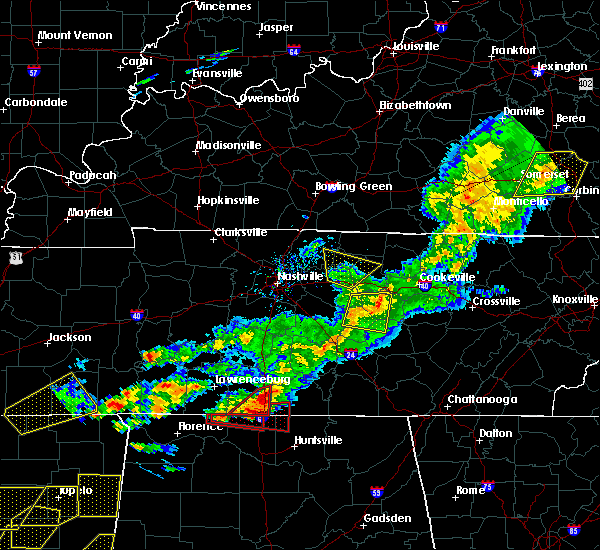 A tornado watch remains in effect until 1100 pm cdt for central tennessee. 5/10/2016 10:12 PM CDT At 1011 pm cdt, a severe thunderstorm was located 7 miles northeast of white house, or 10 miles northwest of gallatin, moving east at 30 mph (radar indicated). Hazards include golf ball size hail. People and animals outdoors will be injured. Expect damage to roofs, siding, windows, and vehicles. 4/6/2016 5:37 PM CDT At 535 pm cdt, severe thunderstorms were located along a line extending from 8 miles southwest of westmoreland to near lebanon, moving northeast at 55 mph (radar indicated. this storm does have a history of producing wind damage, including large trees). Hazards include 60 mph wind gusts. Expect damage to roofs. siding. And trees. 4/6/2016 5:32 PM CDT At 531 pm cdt, a severe thunderstorm was located over gallatin, moving northeast at 50 mph (radar indicated. several reports of damage including large trees have fallen in the wind). Hazards include 60 mph wind gusts. Expect damage to roofs. siding. and trees. Locations impacted include, gallatin, lebanon, hendersonville, mount juliet, dickerson chapel recreation area and bledsoe creek state park. 4/6/2016 5:23 PM CDT At 523 pm cdt, a severe thunderstorm was located near hendersonville, or near gallatin, moving northeast at 50 mph (radar indicated). Hazards include 60 mph wind gusts. Expect damage to roofs. siding. and trees. Locations impacted include, gallatin, lebanon, hendersonville, mount juliet, dickerson chapel recreation area and bledsoe creek state park. 4/6/2016 5:04 PM CDT At 503 pm cdt, a severe thunderstorm was located over nashville, moving northeast at 50 mph (radar indicated). Hazards include 60 mph wind gusts. Expect damage to roofs. siding. And trees. 3/31/2016 6:53 PM CDT At 652 pm cdt, a severe thunderstorm was located 7 miles south of hartsville, moving north at 45 mph (radar indicated). Hazards include 60 mph wind gusts and quarter size hail. Hail damage to vehicles is expected. Expect wind damage to roofs, siding, and trees. 7/14/2015 11:23 PM CDT The severe thunderstorm warning for northern smith, sumner, trousdale and southern macon counties will expire at 1130 pm cdt, the storms which prompted the warning have weakened below severe limits, and no longer pose an immediate threat to life or property. therefore the warning will be allowed to expire. however gusty winds are still possible with these thunderstorms. 7/14/2015 11:16 PM CDT At 1115 pm cdt, severe thunderstorms were located along a line extending from gallatin to 7 miles north of carthage, moving southeast at 40 mph (radar indicated). Hazards include 60 mph wind gusts and penny size hail. Expect damage to roofs. siding and trees. These severe thunderstorms will remain over mainly rural areas of northern smith, sumner, trousdale and southern macon counties, including the following locations, castalian springs, mitchellville, bledsoe creek state park, dixon springs, pleasant shade, cottontown, bethpage and oak grove. 7/14/2015 11:03 PM CDT At 1102 pm cdt, severe thunderstorms were located along a line extending from near portland to near westmoreland to 8 miles south of red boiling springs, moving southeast at 35 mph (radar indicated). Hazards include 60 mph wind gusts and penny size hail. Expect damage to roofs. siding and trees. these severe storms will be near, castalian springs around 1115 pm cdt. hartsville around 1115 pm cdt. Other locations impacted by these severe thunderstorms include mitchellville, bledsoe creek state park, dixon springs, pleasant shade, cottontown, bethpage and oak grove. 7/14/2015 10:46 PM CDT At 1044 pm cdt, severe thunderstorms were located along a line extending from 7 miles northwest of portland to 7 miles southeast of scottsville, moving southeast at 45 mph (radar indicated. 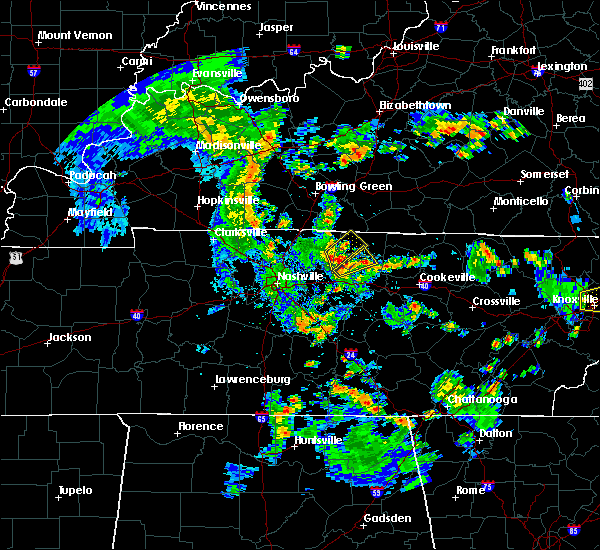 at 1038 pm cdt...trees were blown down in scottsville kentucky with these storms). Hazards include 60 mph wind gusts and nickel size hail. Expect damage to roofs. siding and trees. severe thunderstorms will be near, lafayette around 1045 pm cdt. gallatin, red boiling springs around 1110 pm cdt. hartsville around 1125 pm cdt. Other locations impacted by these severe thunderstorms include mitchellville, bledsoe creek state park, dixon springs, pleasant shade, cottontown, bethpage and oak grove. 6/8/2015 2:23 PM CDT The severe thunderstorm warning for central sumner and east central robertson counties will expire at 230 pm cdt, the storm which prompted the warning has weakened below severe limits, and no longer poses an immediate threat to life or property. 6/8/2015 2:10 PM CDT At 209 pm cdt, a severe thunderstorm was located 6 miles east of white house, and moving east at 30 mph (radar indicated). Hazards include 60 mph wind gusts and quarter size hail. Hail damage to vehicles is expected. expect wind damage to roofs, siding and trees. The severe thunderstorm will affect mainly rural areas of central sumner and east central robertson counties. 6/8/2015 1:56 PM CDT At 154 pm cdt, a severe thunderstorm was located near white house, and moving east at 30 mph (radar indicated). Hazards include 60 mph wind gusts and quarter size hail. Hail damage to vehicles is expected. expect wind damage to roofs, siding and trees. the severe thunderstorm will be near, gallatin around 220 pm cdt. Other locations in the warning include cottontown. 5/26/2015 3:15 PM CDT At 310 pm cdt, a severe thunderstorm was located 8 miles east of gallatin, and moving northeast at 50 mph (radar indicated). Hazards include 60 mph wind gusts. Expect damage to roofs. siding and trees. The severe thunderstorm will be near, westmoreland around 325 pm cdt. 5/17/2015 5:48 PM CDT At 545 pm cdt, severe thunderstorms were located along a line extending from 5 miles southwest of hartsville to lebanon, and moving east at 25 mph (radar indicated). Hazards include 60 mph wind gusts. Expect damage to roofs. siding and trees. severe thunderstorms will be near, hartsville around 600 pm cdt. other locations in the warning include tuckers crossroads. 75in. 5/17/2015 5:29 PM CDT At 526 pm cdt, severe thunderstorms were located along a line extending from gallatin to belinda city, and moving east at 30 mph (radar indicated). Hazards include 60 mph wind gusts. Expect damage to roofs. siding and trees. 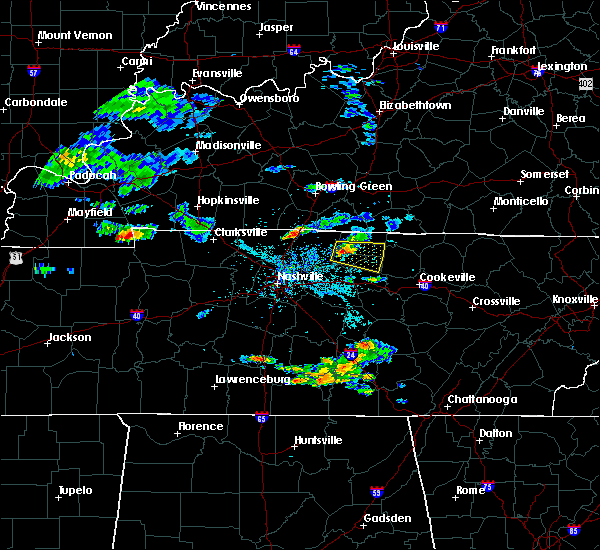 severe thunderstorms will be near, lebanon around 540 pm cdt. hartsville around 600 pm cdt. other locations in the warning include castalian springs, dickerson chapel recreation area and tuckers crossroads. 75in. 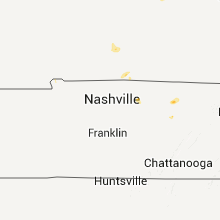 5/17/2015 5:20 PM CDT At 518 pm cdt, a severe thunderstorm was located 6 miles northeast of hendersonville, and moving northeast at 35 mph (radar indicated). Hazards include 60 mph wind gusts. Expect damage to roofs. siding and trees. the severe thunderstorm will be near, gallatin around 525 pm cdt. other locations in the warning include cottontown. 75in. 5/17/2015 5:10 PM CDT At 507 pm cdt, a severe thunderstorm was located near hendersonville, and moving northeast at 35 mph (radar indicated). Hazards include 60 mph wind gusts. Expect damage to roofs. siding and trees. the severe thunderstorm will be near, gallatin around 525 pm cdt. other locations in the warning include cottontown. 75in. 4/20/2015 1:52 AM CDT The severe thunderstorm warning for southwestern macon, northern wilson, trousdale, southeastern sumner and west central smith counties will expire at 200 am cdt, the storm which prompted the warning has weakened below severe limits, and no longer poses an immediate threat to life or property. however, gusty winds up to 50 mph are still possible with this thunderstorm. 4/20/2015 1:43 AM CDT At 140 am cdt, a severe thunderstorm was located 7 miles southwest of hartsville, and moving east at 45 mph (radar indicated). Hazards include 60 mph wind gusts. Expect damage to roofs. siding and trees. the severe thunderstorm will be near, hartsville around 150 am cdt. other locations in the warning include dixon springs. 75in. 4/20/2015 1:29 AM CDT At 127 am cdt, a severe thunderstorm was located near gallatin, and moving east at 45 mph (radar indicated). Hazards include 60 mph wind gusts. Expect damage to roofs. siding and trees. the severe thunderstorm will be near, hartsville around 150 am cdt. other locations in the warning include bledsoe creek state park, castalian springs, dickerson chapel recreation area and dixon springs. 75in. 4/19/2015 3:58 PM CDT At 351 pm cdt, a severe thunderstorm was located 5 miles west of gallatin, and moving northeast at 45 mph (radar indicated). Hazards include 60 mph wind gusts and penny size hail. Expect damage to roofs. siding and trees. the severe thunderstorm will affect mainly rural areas of northwestern wilson and sumner counties. 0. 75in. 4/3/2015 5:14 PM CDT A tornado warning remains in effect for northern wilson. southwestern trousdale and south central sumner counties until 530 pm cdt. at 510 pm cdt. a severe thunderstorm capable of producing a tornado was located near mount juliet. and moving east at 50 mph. hazard. Tornado and quarter size hail. 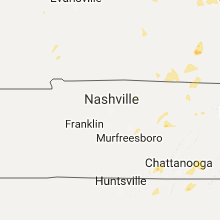 4/3/2015 5:00 PM CDT The national weather service in nashville has issued a * tornado warning for. east central davidson county in middle tennessee. southern sumner county in middle tennessee. southwestern trousdale county in middle tennessee. Northern wilson county in middle tennessee. 4/3/2015 4:56 PM CDT The national weather service in nashville has issued a * severe thunderstorm warning for. northeastern davidson county in middle tennessee. southern sumner county in middle tennessee. western trousdale county in middle tennessee. Northern wilson county in middle tennessee. 4/3/2015 2:06 PM CDT A severe thunderstorm warning remains in effect for northern sumner and extreme northeastern robertson counties until 230 pm cdt. at 205 pm cdt. a severe thunderstorm was located 5 miles southeast of portland. and moving east at 60 mph. hazard. 60 mph wind gusts and quarter size hail. 4/3/2015 1:56 PM CDT The national weather service in nashville has issued a * severe thunderstorm warning for. eastern robertson county in middle tennessee. northern sumner county in middle tennessee. until 230 pm cdt * at 155 pm cdt. A severe thunderstorm was located near cross. 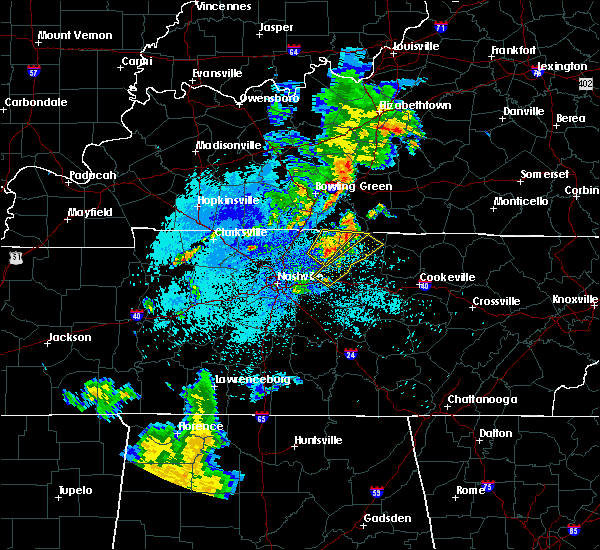 5/24/2011 1:41 PM CDT Quarter sized hail reported 8.5 miles W of Castalian Springs, TN, public rpt of quarter sized hail.